The Franciscan family consists of Catholic laity, religious and priests who recognize that they are called to follow Christ in the footsteps of Saint Francis of Assisi. In this family there are four orders: First Order of Friars Minor, Second Order of Poor Clare nuns, Third Order religious and the Secular Franciscan Order. Secular Franciscans seek to deepen the universal call to holiness by following Saint Francis of Assisi and in accord with the General Constitutions and Rule of the Secular Franciscan Order. The Rule was approved and confirmed by Pope Paul VI on June 24, 1978. The Secular Franciscan Order is composed of Catholic men and women, married and single, old and young, who live at home, according to their Rule of Life. They were originally known as the Little Brothers and Sisters of Penance. Francis is the man of penance in the sense that he accepted the gospel as a message to live in the world. 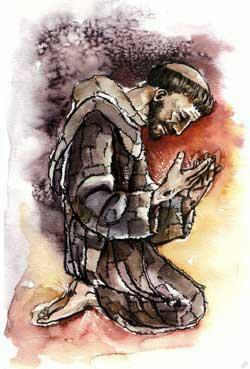 Secular Franciscans live the gospel in fraternal community by following the example of Saint Francis of Assisi. They are both active and contemplative, going from gospel to life and life to the gospel. Their call embraces a call to evangelization. The rule and life of the Secular Franciscans is this: to observe the gospel of our Lord Jesus Christ by following the example of Saint Francis of Assisi, who made Christ the inspiration and the center of his life with God and people. Secular Franciscans should devote themselves especially to careful reading of the gospel, going from gospel to life and life to the gospel. The identity of the Secular Franciscan is rooted in our secularity. St. Francis brought the practice of gospel life out of the monasteries into the world of the family and society. This was, indeed, very good. Deeply spiritual and generous men and women, who could not abandon family responsibilities, now had a way to follow the Lord in the manner of St. Francis. The Rule identifies the world as the place where the brothers and the sisters, led by the Spirit, strive for perfect charity, in [our] own secular state. The world is our home and our mission field, and we are stewards of its resources and responsible for its care. Francis puts the commandment of love as the foundation for the life of penance. To do penance is to love God and one’s neighbor. As sons and daughters of Adam and Eve, we must have an attitude of examining ourselves daily, repenting of all sins and resisting the sinful tendencies of our fallen nature. This process is not possible through human effort alone. A sacramental life, the source of grace, especially the Eucharist, is necessary. One must act in conformity with the conversion that has been accepted, living in the spirit of the Beatitudes. The result of such conduct will be the attainment of that happiness which man desires and will effect the person’s sharing in the Trinitarian life of God. This is the essence of the life of penance. Act in conformity with the conversion that the person has accepted (a life which produces worthy fruits of penance). The Secular Franciscan vocation can be properly and effectively fulfilled only through life in fraternity. It is a communal experience. The Order is divided into fraternities, canonically established, at the local, regional, national and international level. Requests for admission are presented to the local fraternity. Admission is gradually attained through a time of initiation, a period of formation, and profession of the rule. Profession is a permanent commitment. The “T” or “TAU CROSS” worn by Franciscans is an ancient Christian symbol. Some trace it back to the time of the prophet Ezekiel. Ezekiel spoke about people being marked with an “X” or “T” to indicate they belonged to God (Ezekiel 9:4-6). Others connect the TAU with the cross of Jesus and his willingness to die for us. As such it becomes a sign linking the wearer with the Lord. In the book of Revelation, the TAU signifies God the Father and is related to the name of the Lord (Revelation 7:3). In the “Didache,” an early Christian writing, the TAU means the word of God. Dedicated to the crucified Lord, Francis used the TAU to sign his name and to identify with Jesus. Throughout Franciscan history the TAU has been a sign of commitment and a reminder of the love that Jesus has for us. God is good. God is humble. This is the beginning for Franciscan theology. Saint Francis entered into the mystery of God and found these two attributes. In humility God bends over to embrace the world in love, accepting us right where we are, dwelling in the brokenness of our own lives. God is all good, supreme good, totally good.